Impacts of climate change on agriculture have severe repercussions on economic activity, livelihoods, and food production, particularly in agriculture-dependent societies of the developing world. Resilience of agriculture to such impacts is of paramount importance as agricultural sector holds significant climate mitigation potential, through reductions of GHG emissions, enhancement of sequestration, and is a main driver for forest-related emissions. Agriculture sector, including crop, animal husbandry, fisheries, and agro-processing, is vital for food, nutritional and livelihood security supporting economic growth and social transformation of the country. Contribution of agriculture sector to the national gross domestic product (GDP) has declined from 19% in 2004-05 to 14.2% in 2010-11, while overall GDP has grown by an average of 8.62% during 2004-05 to 2010-11 (2nd NATCOM). This rapid decline is essentially due to high growth in the industry and services sector. Nearly two-third of the population depends directly or indirectly on agriculture for their livelihood followed by forests and fisheries. Indian agriculture is monsoon dependent, with over 60% of the crop area under rainfed agriculture makes it highly vulnerable to climate variability and change (2nd NATCOM, GoI). Increasing frequency and intensity of extreme weather events also have a direct bearing on agriculture. Most simulation studies have shown a decrease in duration and yield of crops as temperature increased in different parts of India (Aggarwal et al., 2001)1. Magnitude of this response varied with crop, region and climate change scenario. With increase in temperature (by about 2º – 4º C) wheat and rice potential grain yields would reduce in most places. However, if temperature increases are higher, western India may experience some negative effect on productivity due to reduced crop durations (First NATCOM, GoI). Reductions in wheat yields due to climate change are predicted to be more pronounced for rain fed crops (as opposed to irrigated crops) and under limited water supply situations because there are no coping mechanisms for rainfall variability (IARI 2009)2 . The study also predicts boundary changes in areas suitable for growing certain crops such as wheat due to climate change (Figure 1). Studies in various parts of the world have shown that apart from change in meteorological conditions (rainfall, temperature, humidity etc.) other factors also contribute to vulnerability of communities to climate change impacts. Indian agriculture is at crossroads and has to find a way to feed the growing population while being environmentally, socially, and economically sustainable. To achieve this, India needs to focus on developing and deploying technologies that improve water, fertilizer, labour, and energy use efficiency while simultaneously improving soil, ecosystem, and social resilience; restoring degraded agro-ecosystems; and creating alternate sources of income for farmers. In addition (and of significant relevance) to these formidable goals, India must address the issue of climate change and its potential impacts on agriculture and food security, which could reduce or reverse any gains produced by future agricultural development. 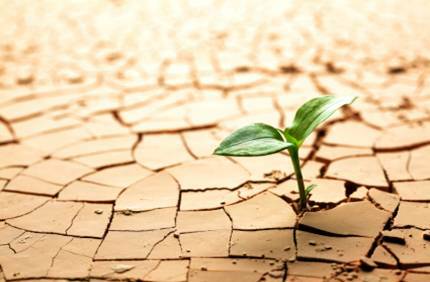 The long-term nature of climate change and the significant impact it can have on agricultural systems requires policy and practices to include both short and long-term planning incorporating climate change knowledge and understanding in — a process referred to as climate change adaptation. Agriculture is a critical component for sustainable developmental policies, since more than 650 million people depend on it. The Green Revolution during 1970s made India self-sufficient in food production through increased agricultural output based on high- yielding seeds, irrigation and fertilizers making it more intensive with regard to use of inputs per hectare of land. Several measures/strategies evolved during the Eleventh Plan to address various issues pertaining to agriculture. In the medium term, the focus has been on improving yields with existing technology, timely availability of water through expansion of irrigation system, and also improvement of existing irrigation systems. Any disturbance in agriculture can considerably affect the food systems and thus increase the vulnerability of a large fraction of the resource-poor population. There is a need to understand possible coping strategies by different sections and different categories of producers to global climatic change. Adaptation strategies would need to simultaneously consider the background of changing demand due to globalisation, population increase, and income growth, as well as the socio-economic and environmental consequences of possible adaptation options. In face of drought and minimal availability even during years of normal rainfall it is of paramount importance to use water efficiently. Production techniques which consume lesser amount of water need to be promoted at the policy level. Fiscal instruments linked to water usage may be put in place. State Electricity Boards need to be provided with fixed targets for water usage beyond which they would need to purchase water reductions from other boards which have performed beyond their targets. A number of policies, plans and schemes are being announced by the central and state governments for development of semi arid regions. However, it has been observed that these plans, programmes and schemes often do not take into consideration climate change and its impacts resulting into these development activities not being climate sensitive or resilient. Therefore, there is a need to apply “climate lens” to government plans, programmes and schemes. It would help in identifying lacunae in the current implementation and planning and thus support practice and policy. Bundelkhand is a typical example of a semi-arid region. It is a socio-economically backward region in central India and straddles the states of Uttar Pradesh and Madhya Pradesh. The last four out of five years have been drought hit. The people in the region are extremely vulnerable to climate change impacts, with their dependence on subsistence agriculture and livestock in climate unfriendly ways. The Bundelkhand Knowledge Platform, developed and managed by Development Alternatives is envisaged to fill this critical gap in relation to semi arid regions in general and Bundelkhand in particular. Agricultural communities have been adapting to changing climate over the centuries. Thus the communities have knowledge which has been accumulated over the centuries and is appropriate for the local region. There is however a need to validate the traditional practices through modern scientific methods. This is necessary since agriculture has been a way of life and a number of practices are more of cultural importance than that of technological. Once validated and improvised the traditional knowledge will be more effective and also more acceptable to the community since it has its origins amongst them. Access to appropriate technology remains a big hurdle to adaptation in agriculture. Though the Krishi Vigyan Kendras along with the Agricultural University system has been making efforts for dissemination of technology among farmers they have not been able to reach the unreachable. Therefore, there is a need to establish Farmer/Agriculture Resource Centres which would serve the last mile connect to the research outputs at the university/research institutes. The resource centres will not only serve technology dissemination but will also provide information and advisory services to the farmers. Weather based crop insurance is a major breakthrough in adaptation to climate change. However, in its current form the insurance system leaves a lot to be desired. Currently insurance amount can be claimed only when the damage to the crops has been 50% or more. If the crop damage is lesser than 50% no claims can be made against such losses. This tends to increase false reporting on the part of the farmer. Another serious issue emanating from this is that farmers are likely to take risky decisions as only damages which are 50% can be claimed for. Also the farmers do not take care of the crop once damaged so as to cross the threshold value beyond which the claim money may be realised. Therefore, the current Weather Based Crop Insurance programme needs to be revamped. Thus developing adaptation strategies exclusively for minimizing the negative impacts of climatic change may be risky in view of large uncertainties associated with its spatial and temporal magnitude. We need to identify “no-regret” adaptation strategies that may be needed for the sustainable development of agriculture. These adaptations can be at the level of individual farmer, society, farm, village, watershed, or at the national level.